I have to admit, during our off season I do not check this blog very often. When the whales are gone, apparently, so am I! However, I have received a few comments recently which had reinvigorated me, and reinforced how very lucky I, along with my coleagues are, that we get to enjoy these animals when they migrate to our home. At the moment, I am giddy for them to arrive. The first sighting has already occurred, about 2 weeks ago off of Kauai, but that does not mean I am any less excited for the first time I see my returning buddies! After reading these recent comments, and reviewing the most recent footage, I remembered how special of an experience it is to look a whale in the eye. I recall once watching a very informative Hannah Bernard video (filmed in the early 80’s, clearly) which mentioned “looking into the eye of a whale is like looking into the eye of God.” Not being a very religious person, I didn’t connect with that too much at the time. Now, after having this experience several times for myself, I can truthfully say, it is unreal. In a single moment, a person can be humbled beyond any expectation of a humbled human life. To look a creature in the eye that is not only so large, but is also so old… is nothing short of magical. Even for the most non-beleiving among us, it would be hard to classify such an experience as anything less than spiritual. For me, I realized in a very quick, very minute moment, that no matter how much science we have in our favor, we will never understand the world in which they live. We will never know what they know about our own planet. We will never see what they have seen. They live in a very close, yet a very alien world to us. I will forever consider them as inspirational, enduring, and incredibly wise creatures. I hope that the importance I place on these monumental examples of life that is sustained in our oceans will intrigue others, just enough, to make changes in their own lives to help this eco system prosper. This, is my hope for our collective future. Yesterday was an epic battle of the males as they fought over our single ladies. Two things were notable throughout the day. The first was interesting, and something I have never seen before. There was a group of about 6-8 males, fighting and getting really aggressive. At one point, one of the males was laying on top of another. They surfaced together several times and it was clear that he was using his body weight to hold the other one down. Similar to how I describe orcas attacking calves, this whale was apparently attempting to hold the other under, which, if successful, would stop the other male from surfacing and getting air. As our day came to a close, we were getting ready to head in after a sunset sail. Captain Kevin noticed a VERY large competition group out toward the wind line. We went in and found what must have been 12 + whales. These guys were incredibly aggressive. They were up and down, changing course, altering their speed…they were all over the place. It was a good show initially but what was amazing was when we left, the group followed us. It may have been the female enjoying the protection of the boat, but regardless, they surfaced near us and the battle continued beneath Trilogy IV. When they made their way to the starboard bow, we saw one animal take a head bash to the belly, meanwhile, others were landing on top of each other. We saw bloodied noses and worn down tubercles. It is clear that we have rounded the hill on the 2013 whale season and, on the back side of this season, it will be a brutal fight for the final females lingering in the basin. Why Are Teenagers Always So Confused? 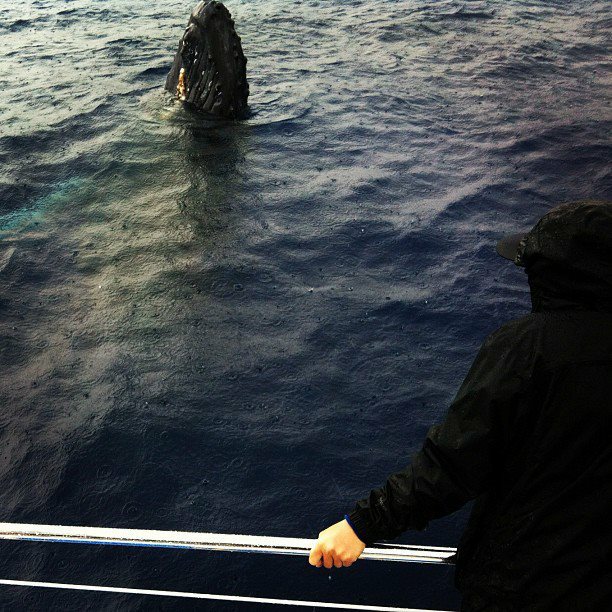 Today, we had a snorkel trip in the morning, followed by a whale watch. If any of you were around today, you would know it was a pretty rainy day. This typically gets me excited, any time there’s a slight change in weather, it is kind of nice! 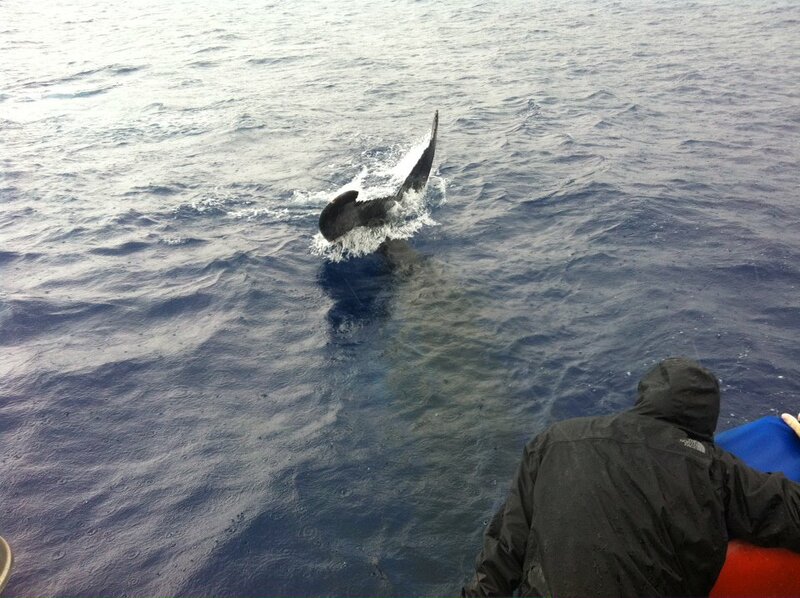 The whales do not mind a change in weather, in fact, I think they prefer it. We saw a few breachers in the final minutes of our snorkel trip. 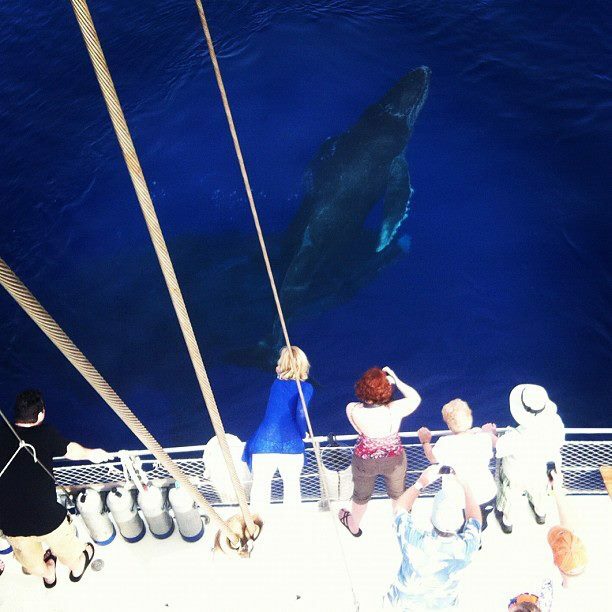 This little guy was near Kaulana, left Kaulana and came to check out our boat, Trilogy Elua. He stayed with us for the majority of our trip. He spy hopped, breached, threw his tail, slapped his tail, rolled over, pec slapped, breathed, looked at us, and just checked us out. He was amazing. This was the first whale of the season I could tell for sure was a male. When he rolled over you could clearly see he didn’t have a hemispherical lobe, a basketball sized lump only females have. Check out the attached pictures, that’s me in the north face jacket…like i said, it was cold! !